During the spring semester, Campaign for Community started moving to Phase II. Students and administrators working on the Campaign are reviewing recommendations from the student working groups that met in the fall, reorganizing to implement many of those ideas, and building a network for collaborations across campus. The Student Leadership Team, Collaborations Team, and Communications Team have met weekly, and will continue to meet next semester. All students are welcome to join the meetings. The entire campus community is invited to a Campaign for Community Update & Celebrate event on Wednesday, April 27, at 5 p.m. in the Smith House to hear more details about what the Campaign has achieved so far. The goal of the School Pride Working Group is to establish a greater sense of community by creating events that engage the student body with peers and alumni. Struck by the success the Vernon block party during orientation had with bringing the community together, the group is exploring the possibility of adding an additional block party the Friday of Homecoming Weekend. The group is also developing Saturday morning activities for Homecoming weekend. By potentially instituting new traditions, the group hopes to foster a greater sense of community between Trinity’s present and former students, giving various student clubs and organizations a chance to get involved. Enhancements to the current Family Weekend programming are also being considered. Trinity boasts truly talented students whose robust accomplishments stretch beyond an academic setting. It is the purpose of the Academic Environment Working Group to ensure that these students are recognized for not only their numerous successes, but also for their involvement in shaping the Trinity community. Originally, the Academic Environment Working Group sought to establish a new honors program for students with high GPAs and extensive involvement in multiple areas of the Trinity community. Upon further consultation with various deans, the group decided to explore ways to connect the various honor societies on campus and to raise their overall profile in our community. There remains interest in exploring a professor-student teaching collaborative as part of this work. The Diversity Leadership Team is developing a more inclusive environment for all on the Trinity campus. Team members spoke with staff in the Trinity Counseling Center about the prospects of hiring a counselor who is a person of color. Students continue to advocate for resources and expertise in working with our diverse student body. 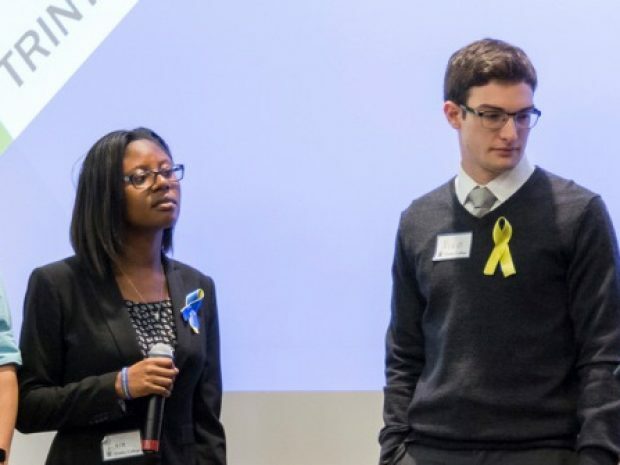 Students from across campus valued the training in diversity and leadership last fall and in January; plans are being laid to shape multi-constituency student leadership training again this fall. Finally, students met with faculty and administrators about the possibility of a domestic diversity-related graduation requirement and are working with Assistant Professor of American Studies Christina Heatherton’s “Investigating Multicultural Education” class to develop a proposal for such a requirement. The Drug and Alcohol Student Working Group started this semester and is in the process of making recommendations on how to reduce high risk behavior associated with the use/misuse of alcohol and drugs. The group focused on the development of a wellness curriculum that addresses various health related issues. The group is looking to have an effect on student use of alcohol and drugs in order to bring a positive change to the overall campus climate. The Student Working Group that seeks to address sexual misconduct is creating two videos with the help of Erik Bloomquist ’14. One is “Your Rights, Your Options” video about reporting options, Title IX rights, services and accommodations. The other is a video that asks what changes students, faculty, and staff envision for the culture of the campus. Students are joined a rally at the State Capitol April 20 to encourage lawmakers to vote for House Bill 5376, which would establish an Affirmative Consent standard to be used at all Connecticut colleges. The group arranged for e-mail updates twice per semester that reports instances of alleged sexual misconduct via the communication to be issued by the Title IX coordinator. They recommend yearly bystander intervention/trauma response training as a possible graduation requirement. Additionally, the group asked that the availability of toxicity testing at the Health Center and Campus Safety be better advertised. The campus has also established a relationship with the Hartford Police Department which leads to the presence of a dedicated officer familiar with sexual assault on college campuses as a resource for the College. The Social Environment Group recommended that students embrace new experiences and celebrate the value of their differences while working together toward common objectives. In order achieve these goals, student leadership training conferences have been held at the beginning of the past two semesters, and will continue in the future. Events like these help to unify the leaders of social and cultural organizations, and to foster more collaborations between groups on campus. This was demonstrated by more communication and collaboration this semester between student organizations from across all areas of campus life. The the Office of Student Activities, Involvement, and Leadership (S.A.I.L.) will be working with next year’s student leaders to start those conversations prior to the end of this semester and at the start of next semester with leadership trainings. Student leaders of the Campaign for Community enjoyed engagement between students and alumni who were on campus this semester for various board and association meetings. The Community Involvement Group is working to implement their recommendation of a program modeled on “United World College Day” that would aim to showcase the many countries and cultures represented on the Trinity campus. Currently meetings are being held to discuss the details of the event that is planned to be held in the spring of 2017. The group is also working on coming up with a name for the event and plans to promote the event in the fall of 2016. Several additional initiatives are currently under way both to respond to recommendations from various student groups and strengthen ongoing campus-wide efforts to build community. The Student Government Association, additional student leaders, S.A.I.L., and other offices reviewed and revised policies and practices around the allocation of funding for student activities and annual campus-wide events. Throughout the semester, students have been working with Dean of Campus Life and Vice President for Student Affairs Joe DiChristina, college staff and administrators, on the redesign of the lower level of Mather Hall.